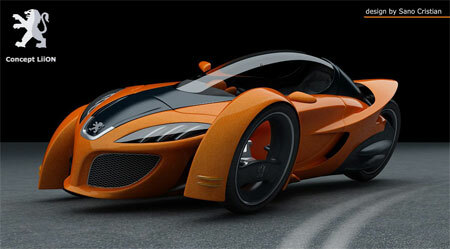 This entry for the 2007 Peugeot Design Contest is the Concept LiiON by Sano Cristian, 27 years old from Romania. 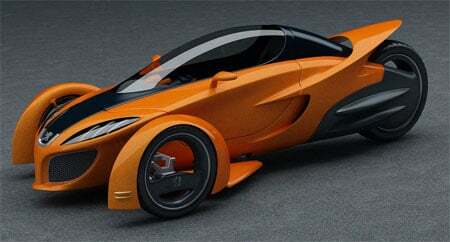 it is a 3-wheeled concept vehicle, with a single wheel at the back, and it is able to lean from side to side for cornering. 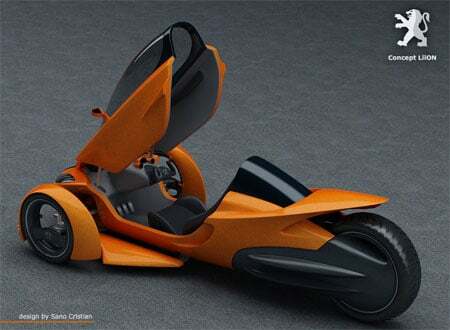 The vehicle is powered by an electric motor powered by lithium ion cells (hence the name LiiON) which drives the single rear wheel. A description by the designer and more photos after the jump. Taking the pleasure of driving to the next level? Easy! Concept Liion was designed to fit everyone’s mood. 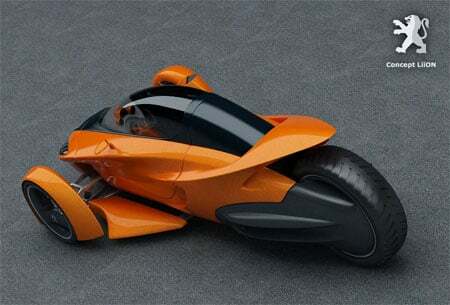 I used a different design approach by combining car and motorcycle design from start. 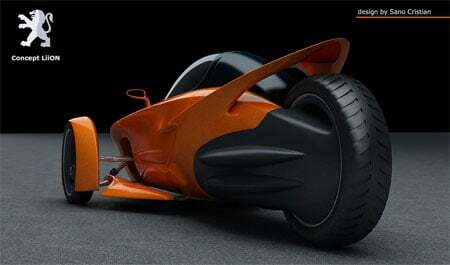 The main design lines flow from front to end to make the car aerodynamic, fast. The lion which is present in all Peugeot cars can be seen here, too: the front grill is its mouth, the headlights are its eyes, the Peugeot badge suggest a nose, and the motorcycle like rear resembles a lion’s tail. 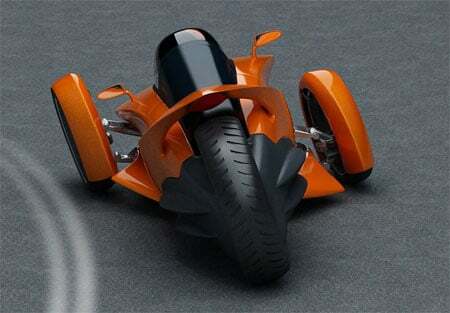 It’s not just for the image, the vehicle can lean left and right in corners, It combines the thrill of riding a bike with the stability and safety of a car, allowing Liion to be a very agile cat, accelerating and breaking fast, giving new challenges to drifters. Leaning also ensures much better comfort when cornering and makes the car appealing to motorcycle riders as well. Well, not really under the hood, but inside the rear wheel an electric motor is placed that moves the car. It is powered by Li-ion (lithium – ion) cells, just like laptops. This technology has been proven to work with cars as well, and it fits Liion perfectly (yes, that’s where the concept name comes from). It is ecological and very practical, since a special recharger for Liion, built to take electricity from a normal power output, can be placed in any garage and recharge the car for the next day fun at the race track. There’s no need for a complex infrastructure before putting Liion on the street. I like the way they look, and i also think that they will be widely used in the future, for example to put an engine inside, or use the outer rim as a rail for electromagnetic propulsion. Wheels can provide a lot of extra space. The lightest materials are always preferred to save power consumption, aluminium – carbon alloys, electrochromic glass to control the amount of light inside the cockpit. For the interior, i would use materials found in sportswear (e.g. memory foams, air cushions, hexalite). For lighting, the choice could be LED lights. The steering wheel should look similar to the Xbox controller. The use of a temperature-changing paint would make Liion lively. An onboard computer controls the car, for optimum performance and power saving. It also calculates the steering and leaning angle necessary at a certain speed, combines this data with algorithms for suspension and then sends signals to a special electromagnetic system, which has a double function in this way (shock absorbing and leaning). Steering is done by small motors near each front wheel, to allow the computer to move them in the perfect position with accurate precision. Leaning can be turned off at any moment, the ground clearance can be changed, and boosts of electricity to the electromagnetic suspension can make Liion jump. I heard that the electromagnetic suspension lowers the feedback to the driver, thus affecting driving pleasure. Then, why not bringing the thrills back by using an advanced force feedback system ? 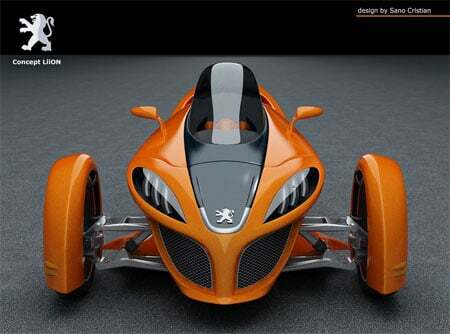 Peugeot and Xbox could develop this together, if it hasn’t been done already. It would provide a great advantage to Liion, because the driving mood could be tuned just like in a videogame, allowing the driver to choose somewhere between a “sunday cruise driving mood” that is almost perfectly smooth and noiseless and a “daredevil mood” that could give thrills even to experienced Formula 1 pilots. Then, user moods that can be saved, tuned,improved, maybe transferred from the Xbox console to a car and viceversa… Concept Liion boosts the imagination. The new xbox presentation for the 20cup would fit well Liion. And since one of the main advantages of my concept is performance in corners, i would present the 20cup “cornered” by one or two “liions”. At an automotive show, this vehicle could be animated to lean towards the visitors from time to time. Inside, an Xbox console could be installed, to allow visitors to drive the car virtually, maybe in the pre-release demo of Project Gotham Racing 4. P (pleasurable)? – leans for stability and comfort, noiseless, very flexible/adaptable/tuneable, good looking. L (lively)? – it’s electric, fast as a lightning, it leans, it’s orange (the colour of energy) . E (efficient)? 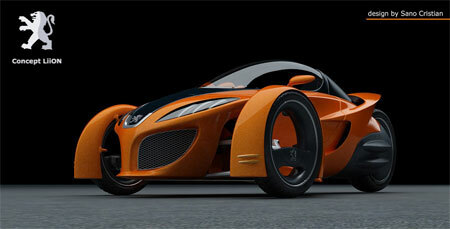 – it is a smart car, using modern technologies, powersaving, doesn’t need a complex infrastructure. A (accessible)? – every technology mentioned for this concept exists today and it is accessible, making Liion a dream come true is in the hands of Peugeot. S (simple)? – simply beautiful! simply fun! everyone will simply love it at first sight. E (ecological)? – it uses electricity, better electric energy storing solutions, more advanced computers,light materials and alloys will make Liion use even less energy and possibly recharging directly in the sunlight. I hope that Liion will get to the heart of the people that see it. Many thanks to Peugeot for giving us good challenge every two years. Good Luck to all participants!